Mac Pharmacy owner Mac Whiloit consults with Terry Dykeman about a prescription. Can a ‘mom and pop’ drugstore focused on pharmaceutical services survive in the cutthroat world of big-box pharmacies that offer everything from lawn chairs to beef jerky? In the case of Mac’s Pharmacy, it can not only survive — it can thrive. 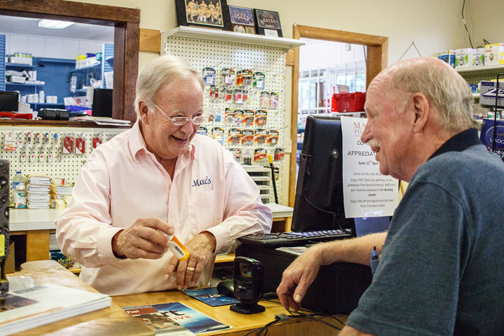 Making sure that he not only has the medications people need, but that they understand dosages, side effects and more has been a hallmark of Mac Wilhoit’s approach since 1989, when he founded Mac’s Pharmacy at the former Morris Drug site on Washington Pike. Free deliveries, medication counseling, in-store screenings, immunizations, compounding and much more have built a loyal clientele, and also helped to create enough requests for a second location in Powell-Claxton in 2009. That location was followed by Mac’s LTC Solutions, a closed-door pharmacy serving long-term care communities in Knox, Anderson, Loudon, Sevier and Blount counties in 2012. Last year, Wilhoit purchased Lowe’s Drug in Maryville, allowing his team to offer home medical equipment as well. 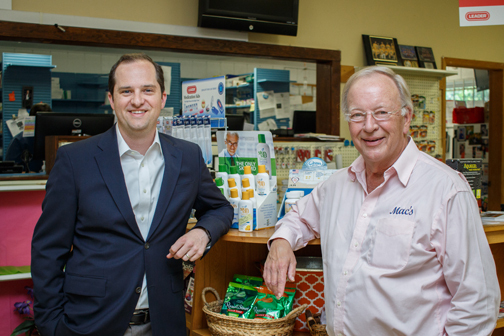 Wilhoit’s devotion to customers has gotten the pharmacy many accolades over the years, most recently the Small Business Excellence Award at the Knoxville Chamber’s Pinnacle Awards. One of nine categories, the Small Business Excellence Award recognizes a company with 50 or fewer employees that has “consistently grown its workforce and revenue and overcome obstacles, including access to capital, operational efficiency, control of expenses, customer loyalty and distribution.” In addition to Mac’s, finalists included Axle Logistics LLC and Pyxl Inc.
Mike Wilhoit, left, with his father Mac Wilhoit at Mac’s Pharmacy. “My father saw a need, and we are meeting it,” says the younger member of the team. “The Knoxville Chamber honors local businesses and businesspeople with Pinnacle Awards as a way to recognize and celebrate excellent companies and individuals who positively impact the local economy and community at large,” says Mark Field, senior vice president of development for the Knoxville Chamber of Commerce. Seeing his father recognized for a simple idea and always putting the customer first, was very gratifying for Mike Wilhoit, who works in the family business as well. Citing one example, he lists a comprehensive array of diabetes programs, including free classes and clinics as well as a more in-depth roundtable that is accredited by the American Association of Diabetes Educators. Other efforts include some basic tutorials for proper prescription usage, because many people don’t read the labels. As the family business moves out of the pharmacy proper and into long-term care facilities that focus on the customer won’t change, he adds. “We are beginning to specialize with assisted living and memory-care homes, as well as group and nursing homes,” Wilhoit explains. “My father saw a need, and we are meeting it. Even as healthcare continues to change, we address specific needs people have and find the niche areas where we can offer services to patient populations that need more help.